TV chef Jamie Oliver should encourage schoolchildren to eat grey squirrels in an effort to save the endangered red species, a Conservative peer says. Lord Inglewood said greys had to be culled to ensure reds - native to the UK - did not die out. "I must confess that I have never actually eaten a grey squirrel... but I am prepared to give it a go," he said. Ministers have ruled out a mass cull of greys, which have forced reds to the brink of extinction in the UK. Most reds are confined to Scotland, Cumbria, Northumbria, the Isle of Wight and islands in Poole Harbour. Greys, introduced from North America in the 19th Century, now number about two million. There are some 160,000 reds. Will squirrel prove as popular as salads among children? 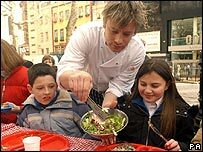 Lord Inglewood said: "What about celebrity chefs like Jamie Oliver promoting (the grey) for school dinners? "Indeed the House authorities could put it on the menu here." He added: "Don't let's forget that a number of things we eat as a matter of course are entirely loveable creatures and they appeal to the wider world. What's the difference? "More importantly it's not only me that's going to feel let down. It's going to be the red squirrels too." Lord Inglewood said: "Unless something radical and imaginative is done Squirrel Nutkin and his friends are going to be toast." 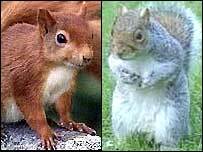 In January, the Department for the Environment, Food and the Regions announced a cull of grey squirrels across England. It will use poison to reduce numbers over the next three years, but the aim is not to eradicate greys completely. There are so far no plans for a mass cull in Scotland. Another Conservative peer, Lord Peel, said greys not only forced reds out of their habitats, but were also carriers of squirrel pox, which is fatal to reds. He said the government, the Forestry Commission and other bodies were failing to deal with the problem. Environment minister Lord Bach told peers: "What we should be talking about now is how we can preserve the remaining viable populations of red squirrel which, rather ironically, was at one time itself considered a pest species. "Although the decline in red squirrels over the past 50 years means that it is a species at risk in the UK, we don't believe it is at risk in Europe. "That's why it is protected here under the Wildlife and Countryside Act." Last year, Mr Oliver launched a campaign to improve the quality of England's school dinners, which resulted in extra government funding to raise standards.